Watch a product demonstration to learn more about Tech Lab carts by Interior Concepts. 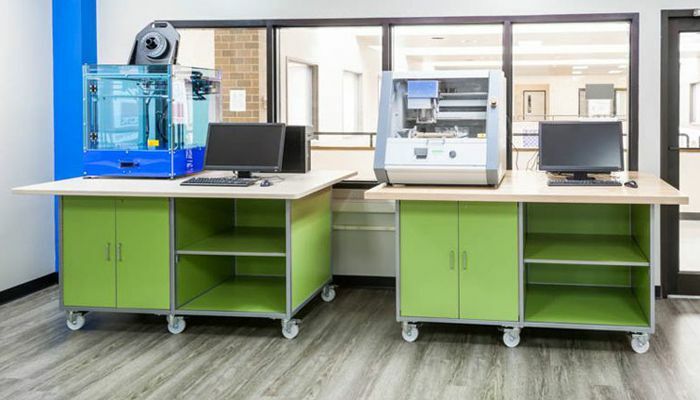 These carts work well in STEM and STEAM labs, CTE areas, Makerspaces, and Fab Labs. Tech lab carts are available in a variety of designs and sizes. The most popular sizes are 6’ wide by 4’ deep and 4’ wide x 3’ deep and are 42″ high. If a different size or height would work better for your space – no problem. Interior Concepts can change the design to suit your needs. The carts feature heavy duty locking casters that can accommodate heavy equipment used in experiments and labs. Locking storage is available to store equipment and materials. Either locking doors or a locking door and open shelf combination are standard options. You can get creative with your color choices to create a fun and engaging learning environment. Choose from a wide variety of laminate colors for the base to brighten up your space or create a tech-inspired look. Maple butcher block tops work well for heavy equipment usage, building projects, and can be sanded down to be refinished when needed. If a butcher block top isn’t critical, laminate tops are also an option. This option will reduce the cost while still creating a useful workbench area. If chemical resistance is important we have solutions for that too. Like all Interior Concepts furniture, tech lab carts are Made in the USA, MAS® Certified Green, and feature a limited lifetime warranty. Please reach out to your local Interior Concepts representative for more information. If you’re not sure who your representative is we will put you in touch with one when you request a quote.